Ever since I discovered the power of mind-body practice as a means of promoting health and well-being, I have been curious about the implications of its cross-pollination with music. My first exposure came through my colleague Dr. Matthew Komelski who introduced me to Tai Chi (a.k.a. Taiji). It was not long before I began exploring technology-mediated connections with music, including the Mind Body Interactive project, as well as Tai Chi’s integration in the Linux Laptop Orchestra (L2Ork) as its core performance choreography. In 2013 I had my first research leave and I wanted to use this opportunity to further my exploration of the quantified self, or what some refer to as “consciousness hacking“. The catalyst for this journey was my newfound interest in human breathing as a central aspect of mind-body practice, an activity that can be both conscious and sub-conscious. In other words, our body subconsciously controls breath even when we don’t focus on it, and yet when we do, we can alter its rhythm, or stop it altogether. What is particularly powerful about breathing is that it is inextricably interconnected with the heart rate (HR), blood pressure, and a slew of other processes in our bodies, all of which are directly linked to stress and its abatement. When we are relaxed, our heart rate exhibits a level of heart rate variance (HRV) that is synchronized with our breath–when we breathe in, our heart rate slightly increases, and when we breathe out, it decreases. Over time this results in a sinusoidal HRV, suggesting a person is relaxed. If, on the other hand, our heart rate remains steady, regardless whether we breathe in or out, the HRV is effectively zero, suggesting we are stressed out. Some have pointed out that human’s HR is the most steady right before we die, which implies unprecedented levels of stress commonly associated with the fear of death and the unknown. If one were to attain a better control over their breath in stressful situations, not only would they be capable of lowering the overall HR, but over time they would be also capable of increasing HRV. One of the simple ways of doing this is by slowly and gradually extending breathing out over breathing in (an optimal target is not to breathe in for longer than ~6 seconds and out for more than ~10 seconds) As our body relaxes, so does our breath deepen, so it is important not to force this process or make transition any faster than our body feels comfortable accommodating. It is also not uncommon in high stress situations for this process to require much longer than when we are already reasonably relaxed. Needless to mention, like any exercise, the more you practice, the faster you attain the optimal state. So, as our breathing extends and breathing out gets longer than breathing in, the HRV curve will naturally gravitate towards lower values simply because the out phase will last longer and therefore pull the overall HR lower. So, what does all this have to do with quantified self and music? I wanted to explore ways by which I could use sound to guide this improvement in the overall well-being, most notably by extending breath, lowering the HR, and increasing the HRV. I also wanted to do so with minimally invasive technologies. For instance, a highly accurate way to monitor breath is to use a sensing band around your abdomen and measure how much it expands. This, however, is not particularly practical, nor particularly relaxing (imagine something squeezing your abdomen as you try to relax). At the same time, I also realized that our HR tends to sync-up with music, so I sought ways to explore rhythmic pulse as a means to guide HR towards the desired goal. The end result is a series of hardware prototypes, one of which is shown above–a Meditation Headset. 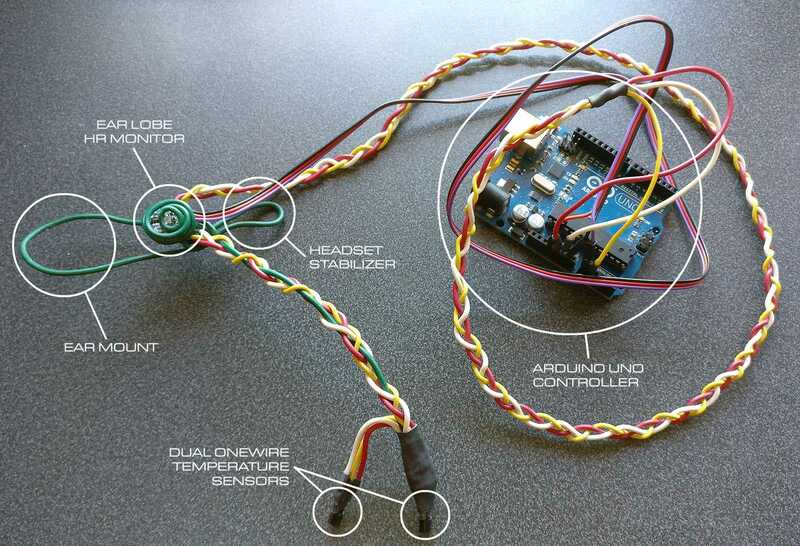 Each iteration focused on different affordable means of monitoring breath and HR, from a simple microphone, to a temperature sensor, and ultimately wind sensor. The Meditation Headset prototype offers minimally invasive system that is hung on one ear only, reads the HR from the ear lobe with only minimal skin contact, and uses temperature sensors to monitor changes in temperature in front of the mouth and the nose due to breathing in (which tends to lower the temperature as the air passes by the sensor), or breathing out (which tends to raise observed temperature as the warm air leaves our lungs). Of course, this leaves plenty of creative opportunities to shape the algorithmic music fabric to promote listener’s well-being, effectively closing the biofeedback loop. In the spring 2017, I taught a new course pilot titled New Musical Interfaces where groups of students collaborated on creating new technology-mediated instruments and/or responsive environments. Curiously, one group chose to pursue a similar meditation headset concept using solely microphone. Judging from the exponential growth of well-being tech projects and initiatives funded via Kickstarter, Indiegogo, and similar crowd-sourcing portals, and the unprecedented levels of stress our 1st world society faces today, this appears to be a particularly exciting research domain. I look forward to continuing to explore it and its potentially profound impact on the overall quality of life, as well as empowering others through a series of workshops (like the one at Moogfest 2017) to embark on a similar journey by pursuing their own homebrew solutions through music and technology.